As I discussed in my recent post, “The Culture in Good Times and Bad”, I have been spending a lot of time thinking about the Cardinal Culture and what I have learned about it over the last 10 years. While much has changed over time and while Cardinal grew from four people to over 900 team members today, the Culture remains unchanged. It is still the heart of Cardinal. In summary, Culture drives all the things that make us special; That make us different. It is the thing that makes Cardinal, well, Cardinal. But with that growth to 900 team members, the Culture also starts to mean and embody different things. It starts to impact different people in different ways and, if we are not careful, can start to be twisted in ways it was never intended to do. I think it is important with so many new team members at Cardinal – many of which joined because you were attracted to the buzz around the Cardinal Culture – that Leadership takes time to ensure that all our team members understand the Culture and the expectations that it sets. Most companies are starting to recognize Culture is important but don’t understand how it works. That Cardinal Group has IT! There is no denying that we are a Culture-Driven Team. The Cardinal Culture is not a secret… it is just impossible to copy… so we do not mind sharing it. Like all good recipes, even when you have the list of ingredients, they are still hard to duplicate or to get just right. That is the same with Company Culture. Even with the recipe written in black-and-white, other companies will always struggle to copy it. Our culture is the perfect blend of three very, very important ingredients. When these three ingredients are out of balance – or one is left out – the whole recipe changes drastically. Self. We try to hire the best people possible. We hire winners. We hire people who are passionate, determined, and want to bring their best each day and create fun. Team. We place these people in Teams that work together towards a common team goal and ensure that the team goals always are more important than the individual. We win as a team; we lose as a team. Excellence. As Vince Lombardi once said: “Winning isn’t Everything, but wanting to win is.” We will not win at everything we do – and that is fine – we learn from our failures. But we will always strive for greatness. We will hold each person and the team as a whole, to high standards. We are not the Browns, we are the Patriots! We expect to win. We work hard as a team to put ourselves in a position to win. Average Players make an Average Team. While there can certainly be synergy to make the sum greater than the parts, it is impossible to have an amazing team without having amazing individuals. If you have amazing individuals that only care about themselves and not the team, you produce a “dog eat dog” company where everyone has their own agenda and everyone works towards personal, not Team goals. The entire company becomes a Shark’s Den. And finally, if you have great players that love the team, but are not committed to excellence, you do not win. The business world is simply too competitive and the companies that accept “good enough” are that – just good enough. Behind our Culture are the Core Values. These 10 values are the foundation of Cardinal and help team members understand what actions are expected (and those that are not allowed). The Core Values certainly cross-over between the three “buckets” below and actually act as a glue that holds the whole thing together. The Cardinal Culture is so strong that it truly has become the best recruiting and onboarding tool we have. Prospects self-select into Cardinal because they believe they are the type of person that belongs at a company like ours. A company with high expectations and unlimited growth opportunity. A company that has people who are passionate, committed to growth, can laugh and have fun, are open-minded, and who are humble. We help drive that humility by surrounding people with a room full of amazing team members. It’s easy to be confident at a company of average people. It is equally easy to be humble when you are surrounded by other All-Stars! As I like to say, “we don’t play golf at Cardinal.” We play Team sports. We are a company that truly celebrates the achievement of the team over the achievement of each person. One of our biggest competitive advantages as a Company is our organizational structure which was created to drive people into teams – so they could work together to outperform our competitors that operate as individuals. The key to our teamwork is open communication, acting with respect, and overcoming obstacles with better ideas not just more resources. 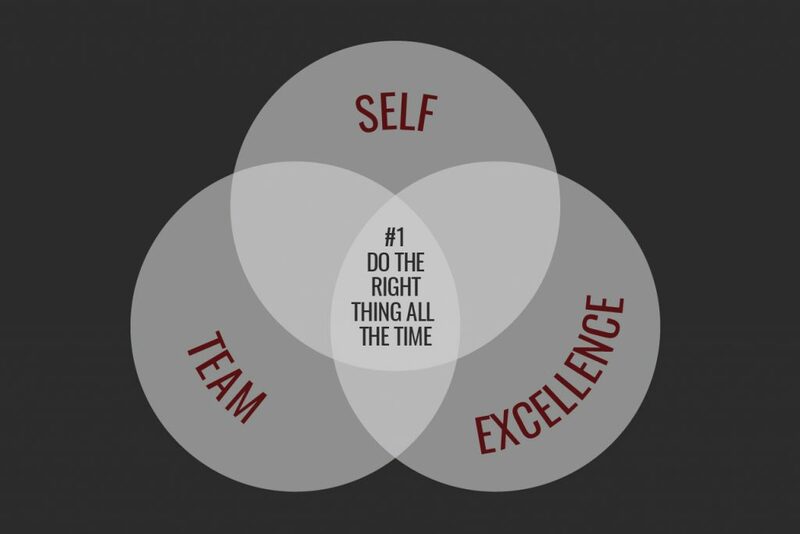 At the intersection of Self, Team, and Excellence – at the Heart of the Company – is Core Value #1, Do The Right Thing All The Time. The lifeline of our entire Culture is centered on our commitment to do the right thing. We do the right thing for each other. We do the right thing for our residents. We do the right thing for our clients. And most importantly, we do the right thing for ourselves, so we can hold our heads high and stand behind everything we do. they lack the final and most important ingredient – the commitment to doing the right thing, all the time. As you finish reading this, challenge yourself to answer – Do I embody the Cardinal Culture with my intentions and actions, and if not, what can I do to rise to the challenge of being a true champion of the Culture?